"Mirza Basheer uddin Mahmud Ahmad"
MGA’s eldest living son from his second wife has lots of issues as a child. He was Bashir-2 and MGA was afraid that he was also going to die, thus he (and his team) masked the famous “Promised-Son-Prophecy”. MGA was embarrassed when Bashir-1 died and made lots of excuses. Thus, they were purposely unclear in terms of what child was the Promised Son, they even wrote that it might be Mirza Mubarak Ahmad, however, he died at age 7 in 1907. Interestingly enough, Muhammad (Saw) progeny was cut-off by Allah, thus ending the cycle of prophets on planet Earth. In the below, we prove that Mirza Basheer-uddin Mahmud Ahmad was a sick person, just like his father, yet he was privileged and allowed to do as he wished. He most likely had brain damage from being given opium as a child as well as being poisoned with dirty breast milk. In a new published by Ahmadiyya INC, they tell us of another story. Mirza Basheeruddin Mahmud Ahmad was poisoned from breast milk? “””Hazrat Mirza Bashir-ud-Din Mahmud Ahmad ra was born on 12 January 1889 around 10 o’clock in the evening. He was lovingly nicknamed Mian by his parents. In those times it was customary for a maid to be employed to look after a child. The maid who was appointed to look after him had been very ill but she had not told anyone. Eight of her children had already passed away due to an illness they contracted through her breast milk. The maid, without seeking permission from the parents, gave some of her milk to Mian Mahmud ra. This led to the illnesses infecting the blood of Mian Mahmud ra. From the age of 2 to 12 Mian Mahmud ra remained very ill. Sometimes he would get a fever, while at other times he would suffer from coughing fits. The doctors said that it was unlikely that he would survive very long, but the doctors were not aware of Allah’s promise. Allah had promised that the chosen one would live for a long time and his fame would spread all over the world. He was then married off to a young bride. He then failed his matriculation exam and was an embarrassment to Ahmadiyya. Were the mental issues heriditary? Mirza Basheeruddin kept running wild, he was priviliged and above the law. She ended up dying mysteriously, she had 3 children with the Khalifa, all of those children seem to be missing from the management of the Ahmadiyya Movement. As soon as she died..the Khalifa immediately married again. From roughly 1925, the Khalifa always kept 4 wives, when one would die, he would marry another. Was his younger brother the promised reformer? After become the Khalifa in 1914, Mirza Basheer-uddin Mahmud Ahmad faced the difficulty of explaining he true beliefs of MGA. One of the first few topics that he tackled was that of the nature of prophethood of MGA. The Lahori-Ahmadi’s totally denied prophethood for MGA and only gave it a metaphorical color. In January of 1915, the Khalifa wrote “Qaul al Fasl” and tried to explain the beliefs of MGA on 4 topics, the Khilafat, the nature of of MGA’s prophethood, Takfir for non-Ahmadi’s and the verse of the quran about Ismuhu Ahmad. However, the Khalifa erred in this book and said that books before 1902 were abrogated in terms of MGA’s beliefs on prophethood, Muhammad Ali pointed this out immediately. The Khalifa then wrote “Haqiqat un Nubuwwat”, “Reality of Prophethood”. “”””The books in which he has denied being a prophet in clear words, and has called his prophethood as partial (juz’i) and imperfect, and as the prophethood of saints (muhaddas), are all without exception books from before the year 1901 … and in the books after 1901 there is not one book in which he has declared his prophethood as juz’i.”””” (Haqiqat-un-nubuwwat,on alislam.org in the Anwar-ul-Uloom series, v. 2, book 10, p. 443-444). Mirza Naseer Ahmad was the first-born child of Mirza Basheer-uddin Mahmud Ahmad in 1906. He died shortly thereafter however and was buried in Lahore, which is very strange, since MGA and his family were not in Lahore in 1906. See Fazle-Omar, page 78, https://www.alislam.org/library/books/Fazl-e-Umar.pdf. This was MGA’s second grandson it seems. Mirza Aziz Ahmad being the first. All of these quotes are taken from the 2009 online edition of Tadhkirah. See page 592. This prophecy appeared in 1903 and was repeated verbatim in 1906 during the formation of Haqiqatul Wahy. sons and has thus fulfilled His promise …[and] has given me the good news of a fifth one—who was destined to be born as a grandson in addition to these four—that he would certainly be born at some time. sons and has thus fulfilled His promise …[and] has given me the good news of a fifth one—who was destined to be born as a grandson in addition to these four—that he would certainly be born at some time.674 [Haqiqatul-Wahi, pp. 218–219, Ruhani Khaza’in, vol. 22, p. 229]. Accordingly three months ago a son was born to my son Mahmud Ahmad who has been named Nasir Ahmad. [Haqiqatul-Wahi, p. 219, Ruhani Khaza’in, vol. 22, p. 229]. Ahmadiyya mullahs are dangerous. They have been working on covering up the failings of MGA for over 100 years. This is just another case of it. Mirza Nasir Ahmad was born in 1909, after MGA had even died. Ahmadi’s are free to attribute this prophecy to Mirza Nasir Ahmad, however, we have caught them lying about it. As we all know, Ahmadi’s are regularly falsely attributing prophecies. Who is Mirza Bashir Ahmad, the younger brother of Mirza Basheer-uddin Mahmud Ahmad? Mirza Bashir Ahmad was a son of Mirza Ghulam Ahmad who was named Qamrul Anbiyaa (the moon of the prophets) by his father. He was born in 1893 and died on September 2, 1963, at the age of 71. He helped his brother throught the latter’s period as head of the Qadiani Ahmadiyya. This help came in the form of managing properties in Qadian and writing books and essays in the jamaat periodicals that ultimately proved to be quite controversial. His role and his works are now greatly minimized by the Qadiani establishment. Very few Ahmadis know know much about him and his writings. The picture in the above is from the 1924 edition of the Moslem Sunrise. MGA called him the Qamrul Anbiyaa (Moon of the Prophets) allegedly told to him directly by God. It is meant to signify that all the light of all the prophets is reflected in him. Mirza Bashir Ahmad wrote about the death of MGA 20+ years after it happened. He wrote to purposely change the narrative that MGA died of cholera, since that was the main narrative that everyone in British India knew. The children of Mirza Bashir Ahmad? Ahmadiyya sources don’t really explain this at all. Nevertheless, one of his sons is the famous Mirza Muzaffar Ahmad (MM Ahmad). He was born in 1913. We have to come to find out that he had 9 children in total, 5 boys and 4 girls. There whereabouts are unknown by 2018 (see at the 4:45 mark). He doesn’t seem to have taken a second wife either. 1. Mirza Muzzafar Ahmad (born 1913) He married his first cousin, Amatul Qayyum, roughly in the 1930’s. 3. 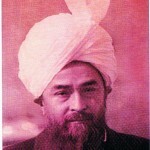 Mirza Munir Ahmad, also spelled as Mirza Muneer Ahmad. ———————–grandson-Mirza Safeer Ahmad, was married to the eldest daughter of Mirza Tahir Ahmad, Shaukat, his first cousin. So far they are unknown. 8 years later (1910) later he matriculated, or he graduated from high school. He was 17. After 7 more years of college he graduated with an M.A. in Arabic. Yet he never wrote anything in Arabic in his whole life, in fact it is unclear what institution gave him a Masters of Arabic. Such a lofty title does not equate with the reduced importance that the Qadiani Ahmadiyya give to him now. In another article in the Review of Religions, circa 1918, Mirza Ghulam Ahmad himself has been referred to as the ‘sun’ and the ‘moon’ of the prophets, together with an explanation of why it is so. His first few article in jamaat newspapers began in late 1914 and they continued for many years. His jamaat took his essays and articles and put them into book form. The first such book was “Kalimatul Fasl” which started as a series of essays and was officially put into book form. This book focused on issues between the Lahori-Ahmadi’s and Qadiani-Ahmadi’s. Those issues included Takfir, prophethood, and whether Ahmadi’s followed the same Kalima as Muslims or not. He began writing about the life of Muhammad (saw). His articles appeared again in Ahmadiyya periodicals. Those articles were edited and turned into books. This book is now in english on the Qadiani-Ahmadi website. Its called, “The Life of the Seal of the Prophets“. There are 3 volumes. We are not sure how much editing was done, that still needs to be explore. However, in this era, the Mirza family was calling child marriage as normal. He writes the first edition of ‘Seeratul-Mahdi”, in english as “The Life of the Mahdi”. Many editions come after, with heavy edits along the way. The first edition is still missing, it is said to have many controversial personal details of MGA and especially his lust for his niece, Muhammadi Begum. He wrote a book entitled “Another Great Prophecy Fulfilled” wherein he claims that the 1934 earthquake in India was predicted by MGA. Mirza Bashir Ahmad beefs with Muhammad Ali (lahori-ahmadi) on the topic of funeral prayers for Non-Ahmadis. He moved to Lahore, Pakistan with his brother, the Khalifa, he then moved to Rabwah, once housing arrangements were made. He writes that the Ahmadiyya system of Khilafat won’t last forever, he also writes that Ahmadi’s can physically kill other Ahmadi’s if that situation ever arises. He was talking about the wars between India and Pakistan and he knew that there were Ahmadi’s in heavy numbers in both military’s. “The khilafat in the Jama‘at will not remain in its pure form forever, but will degenerate into a hereditary institution after the first four khalifas. Apparently, Mirza Bashir Ahmad drew a parallel with the history of the early khalifas of Islam, when after the first four khalifas, who were truly worthy of holding this office, the headship deteriorated into a worldly monarchy in which succession was by descent, and not by the true Islamic worth of a person.” (Translation and quotation directly to the statement of Zahid Aziz, who is a Lahori-Ahmadi top scholar). His speech at the Ahmadiyya Jalsa in 1959 is turned into a book called “The Life of the Good”, in Urdu its called “Seerat-e-Tayyiba”. He writes “Islam and Communism”. Mirza Rafi Ahmad almost became the Khalifa in 1982, when Mirza Nasir Ahmad died. There is lots of controversy on this topic. Official Qadiani-Ahmadi sources have never even commented on the controversy in this election. Some Ahmadi’s seem to have began to follow Mirza Rafi Ahmad instead of the Khalifa. This is where the details get sketchy. Mirza Rafi Ahmad seems to have started his own sect of Ahmadiyya thereafter, it was called Green Ahmediyyat, whom his followers call “Mahmood-e-Sani Confidant of Ayub-e-Ahmadiyyat Harzrat Sahibzada Mirza Rafi Ahmed (AS)”. He is pictured below. 5th March 1927 to 15th January 2004. He died in 2004, he was 76 years old. When Ahmadi’s were forced to evacuate Qadian for Lahore, in 1947, their Khalifa, Mirza Basheer uddin Mahmud Ahmad made some bold prophecies. Most of these references come from the book, “The Ahmadiyya Movement, British-Jewish Connections” (1994). This book has been quoted in many academic studies on Ahmadiyya, it is a really good source of information. Bashir Ahmad begins on this story on page 278. In a speech, most likely a Friday Sermon, it was reported that the Khalifa claimed that Ahmadi’s would return to Qadian soon. He gave out some of his dreams and etc to that effect. In that era, the Khalifa continued to give examples and signs for Ahmadi’s to reassure them that they would eventually move back to Qadian, India. He even went so far as to compare Qadian with Mecca and Medina. Ahmadi’s were ordered to give up their lands in Qadian, and not ask for compensation in Pakistan. Why won’t the Ahmadiyya Khalifa’s move back to Qadian now? As I have proved, the father of the current Ahmadiyya system of organization, their 2nd Khalifa, made prophecies about their return to Qadian, India. Nowadays, this could be easily fulfilled, the government of India has no beef with Ahmadi’s and Ahmadi’s are even considered Muslim in India. So why won’t they move? This would also solved Mirza Masroor Ahmad’s asylum problem as well as many Ahmadi’s who are stuck on asylum in Germany, America, Canada and the UK. As we all know, the family of MGA always made strange prophecies and predictions.